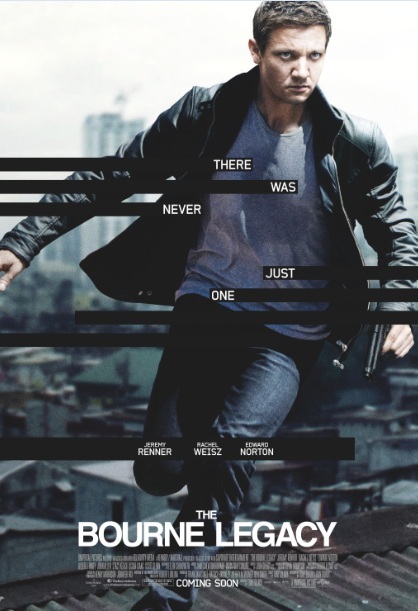 The Bourne Legacy is a most curious film in that it is neither a remake of any of the Bourne Trilogy (Identity, Supremacy, and/or Ultimatum) nor is it, strictly speaking, either a sequel or prequel to any of them. The Bourne Legacy doesn't want you to forget that it ties in (somehow) the the original trilogy yet it wants to be its own film (maybe even the first in a series of new adventures) at the same time. It really is asking the audience to do two things simultaneously: to be judged on its own merits while being seen as part of a larger story. This slightly schizophrenic take on the subject hampers The Bourne Legacy on both fronts, leading to a slightly confused, slightly crazed product, never settling on what exactly it wants to be. The film literally jumps around between two apparently unrelated stories. The first is the various machinations of the government, in particular Eric Bryer (Edward Norton) and Mark Turso (Stacey Keach), who appear determined (not precisely sure about what, but boy do they look serious). The other is some guy out in the Alaskan woods, who has finally found his way to the cabin he was suppose to be at. At this cabin our hero, Aaron Cross (Jeremy Renner) and his minder (Oscar Isaac) are slowly warming up to each other when, unbeknown to them, Bryer and Turso decide that all the Outcomes (agents that received the Bourne medical treatment: a blue and green pill) have to be eliminated. Well, they're given one last pill and they drop dead. The biggest problem with The Bourne Legacy is that Jason Bourne is both in it and not in it at the same time. His presence haunts the film, like some ghost who won't get exorcised out of a home because it is what brings in all the tourists. Director Tony Gilroy (who co-wrote the script with Dan Gilroy) should have some idea of the world of Bourne, but the decision to keep mentioning Bourne, showing his picture, bringing in actors from the previous films, didn't serve either Legacy or add to anything people might remember from the Damon films. What it ironically did was make Renner's Aaron Cross almost a secondary character in his story. Despite the best efforts of Renner, it's Jason Bourne, not Aaron Cross, that appears to dominate The Bourne Legacy, even if he isn't in the film. Gilroy made one mistake after another. There was this focus on Jason Bourne (right down to bringing in characters from the trilogy whom we may or may not remember, such as Joan Allen's Pam Landy for a cameo). There was this long, long, LONG set-up before Aaron Cross even spoke any lines (as well as to why we should care about this strange woodsman roaming around Alaska). Even worse, those scenes were intercut with those in Washington where the 'evil' men are doing 'evil' things. You know they are connected, but it never plays as if the Washington and Alaska stories tie in together until well into Legacy. Add to that one more bad decision: to bring in the extermination of the various Outcomes: they're just thrown in there for a few seconds then killed off. Given that we have little idea who they are their deaths, which should be shocking, don't register because we've never been given reason to care. One wonders why Gilroy wasted so much time giving his Cross' physical prowess and Bryce's wickedness when he could have just set things up with the Outcomes earlier and more importantly, faster. ANOTHER bad decision was to introduce the fact that Byer and Cross knew each other almost past the middle of Legacy. Byer knows of Cross, but Legacy never made it clear if Cross knew Byer was behind the attempts to kill him. Moreover, why put that in if the adversaries will never actually confront each other (unless that is being held back for a hoped-for sequel)? Structurally, Legacy is a mess. We're made to sit through a long intro where very little to nothing happens. In the place of anything called 'character development' or 'plot', we're treated to endless scenes of people looking serious and speaking in somber tones. This I imagine suggests that we have to regard whatever they're talking about with great solemnity but it doesn't so much leave us out of things than give us room to actually care. Worse off, when the Shearing and Cross stories finally come together, it almost seems like they were rammed from two different projects in order to save money. As I kept watching Legacy, waiting for something to happen (and to be fair, a few things did happen, but more on that later), I kept getting the sense that Jeremy Renner should fire his people. It's not so much that he can't handle the action scenes (which he can, though not with any sense of spectacular bravado that either Damon or his Mission: Impossible: Ghost Protocol co-star Tom Cruise can) or even that he couldn't handle the softer moments (though again, the Gilroys script gave him little to latch onto). It's that I keep getting the sense that Renner is being pushed into being an action star rather than an actor when he isn't an action star or even a draw. Renner is much better than his material, but it doesn't help when he scowls throughout the film. Weisz doesn't appear to know what to do with this doctor who isn't interesting and whom we don't care about. Norton looks intense, but a little sliver of me would have loved for him to have gone all-Hulk to go against Hawkeye. Now THAT would have perked up the movie intensely. I don't think I can dismiss one or two good things in The Bourne Legacy. The action sequence where Shearing is attacked and rescued at her home was actually quite good and surprising, and the Manila chase scene, while not as good as it could have been (especially by throwing in some last-minute henchman who pops out of nowhere, we're never introduced to, we don't see as an actual menace, and who is eliminated before the credits roll), did on occasion provide some genuine thrills (as when Weisz comes dangerously close to falling off the motorbike). It's unfortunate that Gilroy wasted so much time and talent into a story that doesn't move. It doesn't want to commit to being its own film apart from the Bourne Trilogy. It goes back and forth: inserting Jason Bourne and those he worked with while trying desperately to convince us that The Bourne Legacy is a new start of adventures. The film is disjointed, confused about itself, and not much of anything. Apart from those two action scenes The Bourne Legacy is more The Bored Legacy.